In The Church of Jesus Christ of Latter-day Saints—sometimes inadvertently called the Mormon Church— ordinances  are sacred, formal acts that have spiritual significance and are performed under the authority of the priesthood,  which is the power and authority that God gives to man to act in all things for the salvation of His children. Some ordinances are called saving ordinances because they are essential for exaltation  —which is the highest state of happiness and glory man (and woman) can achieve in the hereafter. Saving ordinances—which include baptism, confirmation, ordination to the priesthood (for men), the temple endowment and the marriage sealing—require making solemn covenants with the Lord. Other ordinances, while not essential for salvation, are important for comfort, guidance and encouragement. They do not include making covenants with the Lord but are still performed under the authority of the priesthood. These include naming and blessing of infants and administering to the sick and afflicted. All ordinances are designed to bring mankind closer to the Savior, Jesus Christ. What is the source of … moral and spiritual power, and how do we obtain it? The source is God. Our access to that power is through our covenants with Him. A covenant is an agreement between God and man, an accord whose terms are set by God (see Bible Dictionary, "Covenant," 651). In these divine agreements, God binds Himself to sustain, sanctify, and exalt us in return for our commitment to serve Him and keep His commandments. We enter into covenants by priesthood ordinances, sacred rituals that God has ordained for us to manifest our commitment. Members of The Church of Jesus Christ enter into covenants through the sacred, saving ordinances of the priesthood, which are baptism by immersion, confirmation (which includes receiving the gift of the Holy Ghost), ordination to the priesthood (for men), the temple endowment and the temple sealing. Then cometh Jesus … unto John, to be baptized of him. But John [said] … I have need to be baptized of thee, and comest thou to me? And Jesus [answered] … Suffer it to be so now: for thus it becometh us to fulfill all righteousness. Then he suffered him. And Jesus, when he was baptized, went up straightway out of the water. Our foundational covenant, … the one in which we first pledge our willingness to take upon us the name of Christ, is confirmed by the ordinance of baptism. It is done individually, by name. By this ordinance, we become part of the covenant people of the Lord and heirs of the celestial kingdom of God. A person cannot be held accountable for covenants made unless he or she is capable of understanding the depth and importance of the commitment required. Thus, in The Church of Jesus Christ, a person must be at least 8 years of age to be baptized—because 8 is the age of accountability, or the age at which a person is accountable to God for his or her actions. In The Church of Jesus Christ, both the person being baptized and the priesthood holder who is performing the ordinance are dressed in white. 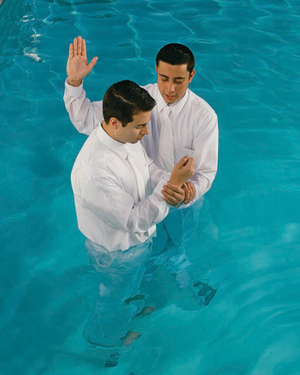 The person being baptized—including all of his or her clothing and hair—must be completely immersed in the water for the ordinance to be complete. If not, the ordinance must be repeated until the person is totally immersed in the water. Members of The Church of Jesus Christ believe that baptism cleanses a person of all sins. Thus, a person emerges from the waters of baptism clean, pure and sinless through the power of the Atonement of Jesus Christ. The scriptures teach the importance of the ordinances of confirmation and receiving the gift of the Holy Ghost. John 3:5 says, “Except a man be born of water and of the Spirit, he cannot enter into the kingdom of God.” Following baptism, a person is confirmed a member of The Church of Jesus Christ and receives the gift of the Holy Ghost—which is the constant companionship of the Holy Spirit. Before a child is baptized, he or she is not an official member of the Church but is known as a child of record—meaning that his or her name is on the records of the Church. A person is confirmed a member of The Church of Jesus Christ and receives the gift of the Holy Ghost by the laying on of hands by those who are in authority. This is done as the one who was baptized sits in a chair, surrounded by worthy priesthood holders, who lay their hands on the person’s head while the designated man performs the ordinance. Faith and repentance lead to the purifying waters of baptism, where we covenant to take upon us the name of Jesus Christ and walk in His footsteps. To uphold us in the desire to lead a purified and holy life, we are endowed with the baptism of fire—the unspeakable gift of the Holy Ghost, a heavenly Comforter who accompanies and guides us as we walk in the path of righteousness. The power of the Holy Ghost can come upon a person before baptism to witness of Jesus Christ and His gospel. But the gift of the Holy Ghost is only received after a person is baptized and confirmed by proper priesthood authority. The priesthood of God is available to worthy male members of The Church of Jesus Christ beginning at the age of 12. In the Church, there are two priesthoods: the Aaronic and Melchizedek. The Aaronic Priesthood is the lesser, or preparatory, priesthood. It is called the preparatory priesthood because it prepares young men to receive the higher priesthood. The Aaronic Priesthood deals with the temporal and outward ordinances of the gospel of Jesus Christ. The offices in this priesthood are deacon, teacher, priest and bishop. Worthy young men are eligible to be ordained to the office of a deacon at age 12, a teacher at 14 and a priest at 16. The bishop is the president of the Aaronic Priesthood in his ward, or congregation. Although the office of bishop is an Aaronic Priesthood calling, a bishop must be an ordained high priest in the Melchizedek Priesthood. A man must be called to receive the office of bishop. Thus, there are no specific age guidelines. The Melchizedek Priesthood is the higher, or greater, priesthood and includes the keys of the spiritual blessings of The Church of Jesus Christ. The offices in this priesthood are elder, high priest, patriarch, Seventy and Apostle. A worthy Aaronic Priesthood holder is eligible to receive the higher priesthood at the age of 18. There are no specific age guidelines for the other offices in the Melchizedek Priesthood. The priesthood is not divisible. An elder holds as much priesthood as an Apostle. (See Doctrine & Covenants 20:38.) When a man receives the priesthood, he receives all of it. However, there are offices within the priesthood—divisions of authority and responsibility. One may exercise his priesthood according to the rights of the office to which he is ordained or set apart. The temple endowment was given by revelation. Thus, it is best understood by revelation, prayerfully sought with a sincere heart. (See Moroni 10:4–5.) President Brigham Young said, “Your endowment is, to receive all those ordinances in the house of the Lord, which are necessary for you, after you have departed this life, to enable you to walk back to the presence of the Father, … and gain your eternal exaltation.” :…Because the ordinances and covenants of the temple are sacred, we are under solemn obligation not to speak outside the temple of that which occurs in the temple. The scriptures teach: “Neither is the man without the woman, nor the woman without the man in the Lord” (1 Corinthians 11:11). For a man and a woman to receive the highest state of happiness and glory in the world to come, they must be sealed by the power of the priesthood. Some have misunderstood and suppose that deceased souls “are being baptised into the Mormon faith without their knowledge” or that “people who once belonged to other faiths can have the Mormon faith retroactively imposed on them.” They assume that we somehow have power to force a soul in matters of faith. Of course, we do not. God gave man his agency from the beginning. “The dead who repent will be redeemed, through obedience to the ordinances of the house of God,” but only if they accept those ordinances. The Church does not list them on its rolls or count them in its membership. Our anxiety to redeem the dead, and the time and resources we put behind that commitment, are, above all, an expression of our witness concerning Jesus Christ. Just as priesthood is eternal—without beginning or end—so is the effect of priesthood ordinances that bind families together forever. Temple ordinances, covenants, endowments, and sealings enable individuals to be reconciled with the Lord and families to be sealed beyond the veil of death. 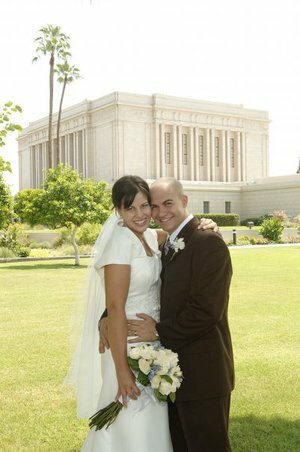 Obedience to temple covenants qualifies us for eternal life, the greatest gift of God to man. Eternal life is more than immortality. Eternal life is exaltation in the highest heaven—the kind of life that God lives. ↑ D. Todd Christofferson, "The Power of Covenants," General Conference, April 2009. ↑ Robert D. Hales, "The Covenant of Baptism: To Be in the Kingdom and of the Kingdom," Ensign, Nov. 2000. ↑ “Priesthood Ordinances and Blessings,” Family Guidebook, (2006), pp. 18-25. ↑ Dieter F. Uchtdorf, "The Way of the Disciple," General Conference, April 2009. ↑ See "Holy Ghost" in the Bible Dictionary. ↑ Boyd K. Packer, "What Every Elder Should Know— and Every Sister as Well: A Primer on Principles of Priesthood Government," Ensign, Feb. 1993. ↑ “Callings in the Church,” Handbook 2: Administering the Church, 19.6. ↑ "Oath and Covenant of the Priesthood," The Guide to the Scriptures. ↑ Gordon B. Hinckley, Teachings of Gordon B. Hinckley (1997), 638. ↑ Discourses of Brigham Young, sel. John A. Widtsoe (1941), 416. ↑ Russell M. Nelson, "Personal Preparation for Temple Blessings," General Conference, April 2001. ↑ Richard G. Scott, "Receive the Temple Blessings," General Conference, April 1999. ↑ D. Todd Christofferson, "The Redemtpion of the Dead and the Testimony of Jesus," General Conference, October 2000. This page was last edited on 17 September 2013, at 15:15.